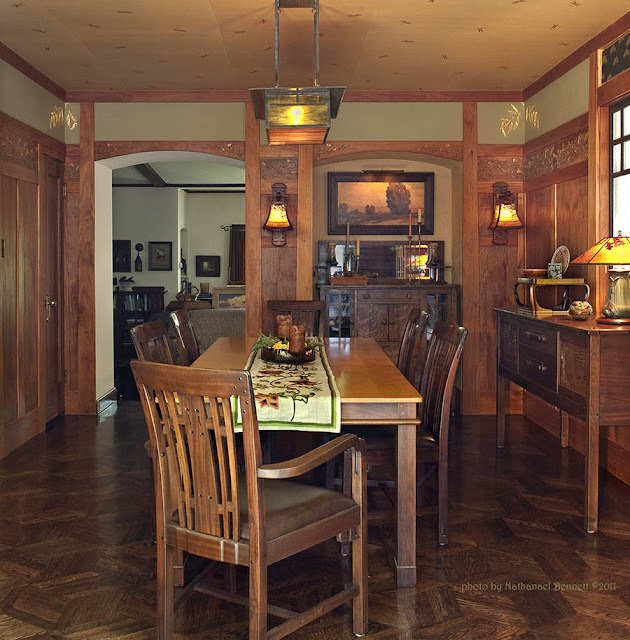 A San Francisco dining room designed in the Arts and Crafts style by Debey Zito Fine Furniture and Design, became a wonderful opportunity for collaboration between several members of my local artisans guild, Artistic License. This very special group is comprised of local artisans who specialize in period design. Debey directed a team of local talent to create this room. A frieze panel of California poppies was hand-carved by Debey's partner, Terry Schmitt. 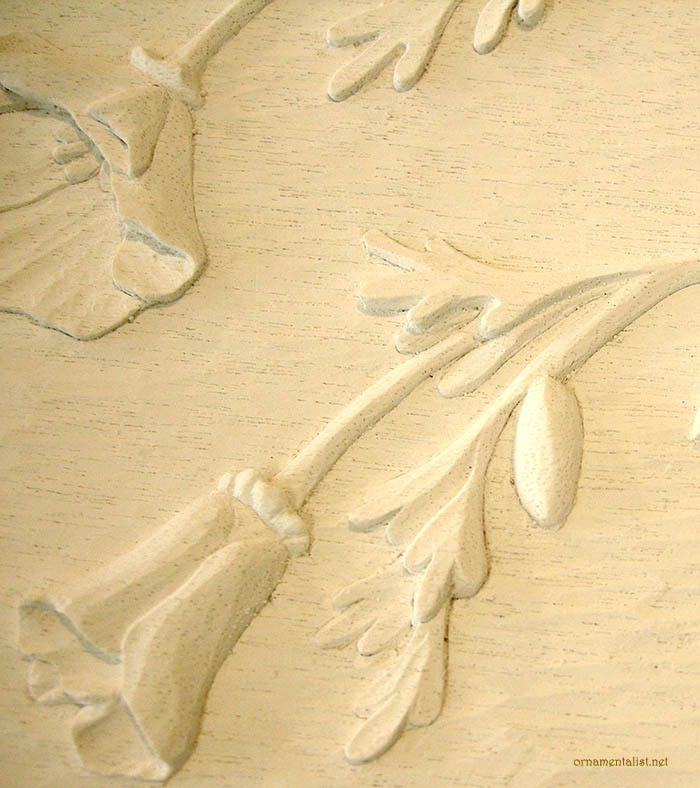 To carve the frieze for the entire room was cost-prohibitive, so ornamental plasterer Lorna Kollmeyer cast them in plaster. 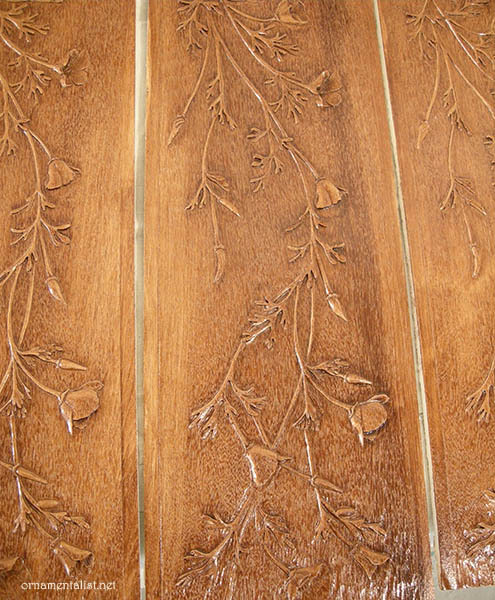 The casting is incredibly sensitive and you can see every pore from the original piece wood as well as every mark in the lovely carving. I painted the new plaster frieze with a faux bois finish, to match the furniture-quality paneling that Debey and Terry installed the room, and polychromed the poppies with mica powders and pigment. 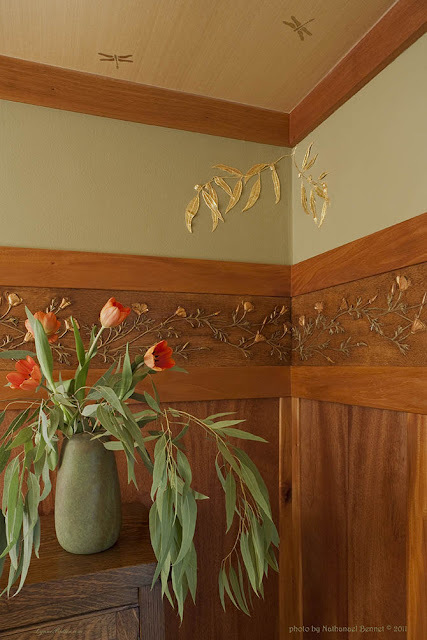 Terry also sculpted the plaster Eucalyptus leaves which I then gilt with 23k gold leaf. The room is capped by custom dragonfly ceiling paper, hand-made in San Francisco by David Bonk. You can read more about this artisan collaboration which has just been published in the Spring 2011 issue of Arts and Crafts Homes magazine. A great collaboration, the painting, gilding, carving and casting all look wonderful. Truly beautiful! It looks so perfect for the period! true kudos go to debey zito for her vision and to terry for creating the original poppy design. i was just the painter and gilder. it's so wonderful to work as part of such a great team. What a fun project! It's stimulating to work with a good team and always welcome the opportunity when it arrives. Thanks for sharing this project and congratulations on the magazine article! The collaboration is a perfect mixing of talents. I'm sure you've discovered, as I have, that collaborations have a way of expanding your own repertoire. All sorts of new possibilities open up!